It's more like a map but also there are some addon features. 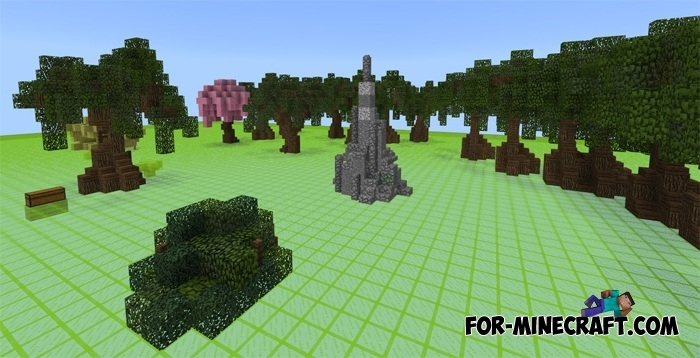 Terrain Maker is the ability to build a unique world or a small part of it at least, using already ready structures such as trees and stone formations. The fact is that many map-makers spend a lot of time on routine. For example, cloning trees takes a huge amount of minutes and also these trees need to be slightly modified. So this map allows you to create natural structures in a matter of seconds by throwing spawn eggs. If you are looking for mods not for the first time, then for sure you will say that there is the Instant Structures mod allowing spawning many ready-made structures. This is actually the case, Instant Structures are quite extensive in application, but it may not be compatible with some versions of Minecraft PE.